On the oddities of coin-versus-bill preferences in Shanghai and Beijing, discussed earlier here, several people wrote to say that I’d forgotten to mention the one truly consequential oddity of Chinese currency, which transcends regional difference: that the biggest note available is the 100 RMB, worth about $13.50. You combine that with the prevalence of cash transactions in China – we’ve paid for expensive airline tickets, several-month security deposits for our apartment, furniture, etc, all with thick wads of 100RMB bills – and you explain several physical features of modern Chinese life. For instance; men can’t get along with just a little wallet; they often need something more like a purse-let, to carry the cash for the day. And, little corner stores in Chinese cities have cash-counting machines of the kind you see only in banks in the United States. For people who have used the 1980-version banknote with a face value of 20 cents, they might be familiar with the head images of the two young ethnic-minority women printed on it. Some people think that these two women are drawn by artists. In fact, they are real people. Finally, after the jump, Joshua Rosenzweig of the Dui Hua Foundation, with his discovery about the modern cash culture of Beijing. Thanks to all. I had just finished up a solitary dinner at the local dumpling restaurant and gave 30 kuai to the waitress for my 28-kuai bill. (Side note: Again, as much as I can sympathize about lousy Chinese beer, there's something quite endearing about nice, frosty mugs of draft Beipi for less than US$1.) She returned to the table with two 1-kuai coins in hand, asking me if I wanted them ("ni yao zheige ma?"). Puzzled by the question, I interpreted it as a rather bold -- and strangely refreshing, given that she couldn't be more than 15 -- ploy for a tip. I considered that I hadn't been to Beijing in some time, that this appeared to be a place frequented by local expats as well as Chinese, and that perhaps, somehow, she was aware that leaving small change like this behind was how things were done in places like Hong Kong (or Europe). I told her "bu yao" and got up to put on my hat and coat. As I started for the door, she rushed back with two one-kuai notes and dutifully gave them to me. This leads me to believe that the notes vs. coins thing might not only be an availability thing, but a preference thing as well. I find this quite baffling, but I find much about Beijing baffling, frankly. 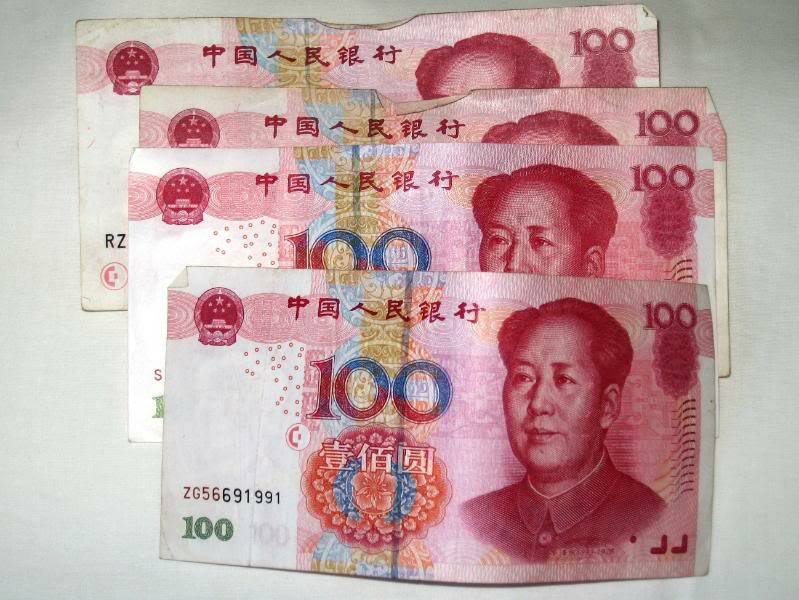 One last note (pun intended): if you ever have to change money in a smaller provincial city (or in Xinjiang) you may run across the 1/100-kuai (fen) note. I took a few of these to my bank in Shanghai once, along with my loose 1-fen and 5-fen coins, in order to exchange them for 1-mao coins (that you can actually use on the street). The teller looked at the tiny notes with amazement and even called his colleagues over for a look. Apparently they hadn't been seen in those parts for years.